Employees want to feel and see the meaning behind every hour they spend at work. Sometimes that meaning is, at its most basic, all about a paycheck. But more often than not, employees feel most engaged when they can see how their everyday job duties connect to their personal goals, professional aspirations, the company’s mission and, at an increasing rate, the community. Overall, 58% of employees consider a company’s social and environmental commitments when deciding where to work. However, 79% of millennials consider the company’s social and environmental commitments. That means the incoming generation (the very generation who has made up most of the workforce since 2015) is weighing their future employer’s social impact into the decision of whether or not to apply. Employees want it. Millennials really want it. Businesses are trying to develop plans to have it. But what is it? Social impact has become a bit of an umbrella statement. Elizabeth Clawson (@eclawson), blogger at Nonprofit Periscope believes the term has come to mean nothing and though we don’t necessarily agree, we can see her point. One of our goals at CyberGrants is to help companies build corporate social responsibility programs that positively impact the community, manage the values and mission of the organization and engage employees. Vaguely stating that your organization needs to make and measure social impact is no help to that cause. Let’s delve into some of the metrics of social impact and how they translate to building a CSR program your company can be proud of. “We throw social impact around as if it means the same thing to all of us.” -@eclawson #CSRTweet This! There’s a lot to be gained from building an employee giving or volunteering program. One such advantage is the boost to the bottom line. In the simplest of ways, companies who donate time and money receive tax breaks, but it goes deeper than that. People want to work with and for companies who have similar priorities and a good reputation within the community which means more connections and business leads. While the potential income/savings might not be the biggest focus of your philanthropic work, it sure is an exciting one. When employees were given the chance to volunteer with coworkers, 81% reported the experience strengthened their relationships. Teamwork, engagement, satisfaction, loyalty… CSR programs benefit employees in so many ways that it can be overwhelming trying to analyze the program’s unique effect on your people. Begin by gathering the number of participants for each project or effort your company organizes. Compare the following metrics to discover retention and satisfaction/engagement improvements. Employee surveys that gather feedback on each particular project are encouraged as well. 81% of employees feel more closely bonded to coworkers after volunteering together.Tweet This! How companies market their CSR involvement externally can help in employment branding, recruitment and business development. Many companies hope to position themselves as an organization who cares about the community and world. In order to do that, they share their philanthropic work and results with their peers, clients and potential employees through media coverage, social media postings, newsletters or a web page specifically dedicated to their unique corporate responsibility. Today’s workforce is interested in making a difference in the world and people want their employer to share similar values. Of course, building a plan for that can highly affect your company’s financial bottom line. Understanding how to measure social impact is important in deciding what direction is most engaging to your employees and beneficial to your budget. Want to see higher employee participation rates in your CSR? 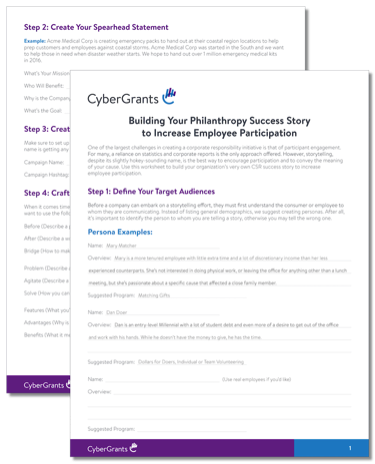 Download this philanthropy success story template to build a more compelling narrative.